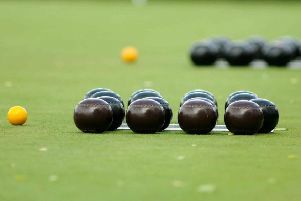 Highgate Wanderers strengthened their position at the top of Louth Indoor Bowls Club’s Morning Triples League last week with two more victories. But it did not come without a struggle in their first match when they trailed 11-3 to Mudlarks before staging a fightback which culminated in them scoring six shots on the final end to win 17-13. Their next game was rather simpler as they won 19-8 against Otters to open a two-point lead over Yorkies who only had the one game, also against Otters, which they won 22-5. Third-placed The Jays remained in the mix, but they were held to a 11-11 draw by Matelots who grabbed two shots on the last end. One of the better games from last week saw In A Minute beat Two Plus One 21-20, with the lead changing hands a few times before the eventual victors finished with a six. Another grandstand finish saw Matelots score three shots on each of the final two ends to pinch a 18-13 win against Wasps. * In Group A of the Australian Pairs, Vera and John Readman lost their unbeaten record when they were beaten 18-8 by Rachael Stanley and Mike Norton. It had been a close game up to halfway, but the Stanley/Norton duo won three successive ends to lead 12-5 and eventually ease to victory. Group leaders Bernice Culham and Terry Cornwall only just hung on to their perfect record when beating Sally Coultas and Malcolm Pearce 13-11. The leaders had trailed for most of the game, but grabbed three shots on the final end. In Group B, John Williams and Paul Hayman maintained their 100 per cent record with a steady 19-12 win over Pat Morley and Brian Paffey. Second-placed pair Liz Draper and Tony Powell had a tough fight against Yvonne Cooper and Chas Dewar before winning 17-12. And in another tight game, third-placed Jean and Fred Bradley held on for a 9-7 victory against Wendy and Peter Neve. * Deb Castle and Russ Dent opened up a three-point lead at the top of the Evening Pairs League after thumping Pat Morley and Barry Toyn 23-9. The second and third-placed pairs were not in action.